Dear colleagues – dancers, performers, choreographers, actors, multidisciplinary artists, movement, dance and contemporary performance practitioners, the long-awaited summer 2016 is coming! 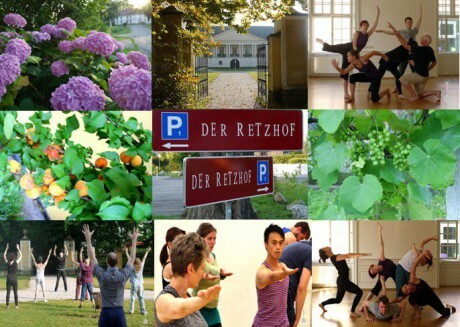 Join the annual international creative week in Austria – intensive practical training, group improvisations, thrilling discussions & discoveries, find new friends, share ideas & start new creative collaborations! The summer school takes place in the green heart of Austria – Styria state (in German „Steiermark“) located in the southeast of the country. Participants stay and work at the territory of the 15th century castle, which is today the modern international arts centre. Accommodation is organized in shared twin/single rooms at the castle guest house (7 nights), 3 meals per day are available for the group (vegetarian/non vegetarian at participant’s choice). The venue is surrounded by nature, fields and woods. The nearest international airports are located in Graz, Vienna and Klagenfurt. There is a train connection to the workshop town. Wish you good luck in your activities & hope to see you soon in Austria!